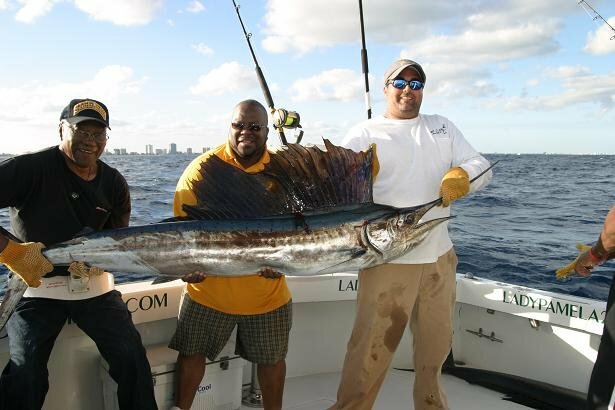 Fort Lauderdale is brining in the New Year with several exciting events. The Super Bowl is back to South Florida for a record breaking 10th time and the Pro Bowl is honoring all star players somewhere other than Hawaii for the first time since 1979, Fort Lauderdale, Florida! With that said, there are A list players and many devoted fans in Fort Lauderdale for the two biggest games of the year. 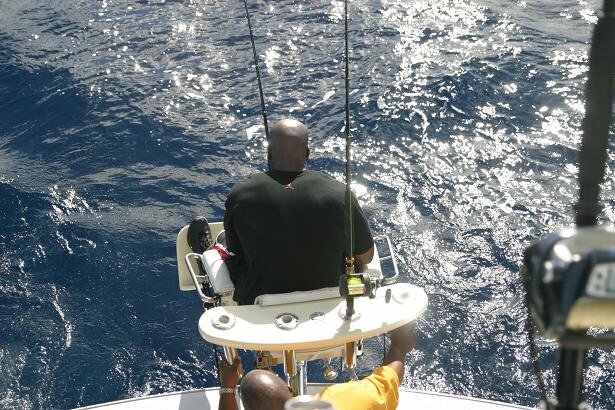 James Harrison of the Pittsburgh Steelers joined Captain Paul and me aboard the Lady Pamela II for a deep sea fishing adventure with his friends and family before the big game this Sunday. 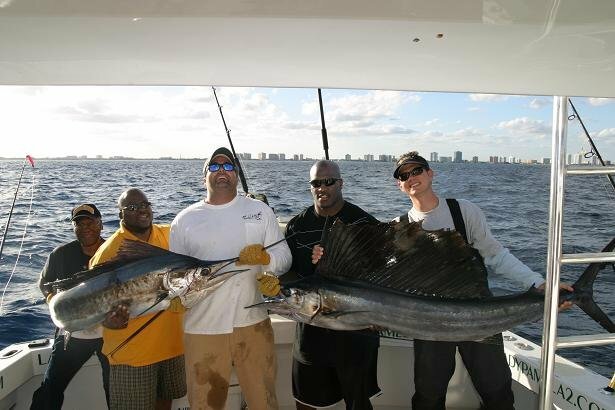 James wanted to battle with something as big as him so we picked up the necessities (live goggle eyes) and headed offshore. 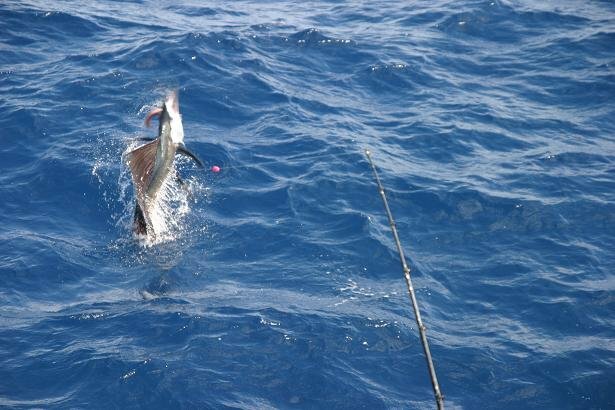 Once we reached our destination, our spread consisted of 4 live goggle eyes dancing on the surface and 2 big shark baits below. We waited patiently for 45 minutes before the right short got a hit. Captain Paul set the hook and we were ready. James jumped into our ultimate fighting chair and the battle began off the transom. 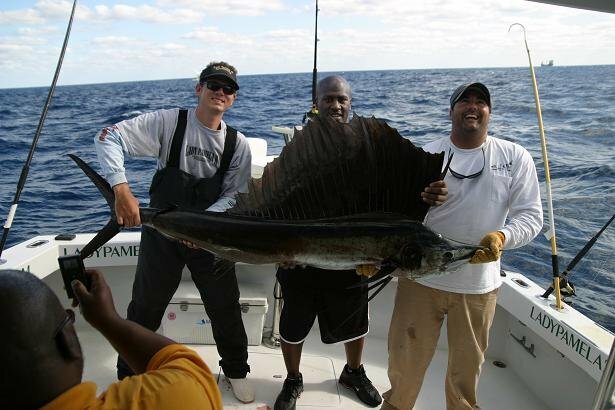 Our first Sailfish of the day totally impressed our anglers; both the fight and the missing bill.